Caffeine is a secondary metabolite produced by several plants, and is primarily used to deter herbivores from eating their leaves. Caffeine is extremely bitter in taste, and its effects on human productivity at 3 AM aside, does not make for a pleasant dining experience for the average moose. However, very small quantities of caffeine are also present in the nectar of more than 50% of all flowering plant species. This is curious, as nectar, unlike leaves, is actually meant to be eaten by animals which are cross-pollinators, like bees in this case. 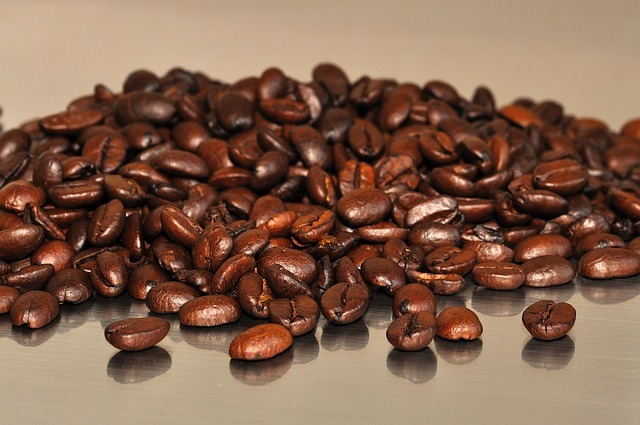 Since caffeine is known to have several psychoactive effects, Margaret Couvillon and colleagues at the University of Sussex decided to test whether the presence of caffeine could influence honeybee behavior while foraging for nectar. For their experiment, the researchers used two feeding tubes, one containing a sugar solution, and the other containing a sugar solution of spiked with a little bit of caffeine. When presented with the two identical feeder tubes, one with caffeine, the other without, the bees spent significantly more time foraging near the caffeinated feeding tube. They also showed a much higher likelihood of executing the waggle dance, and were persistent in returning to the caffeine-containing feeder tube, even when it was empty and no sugar solution was present. All this suggested that the caffeine enhances the honeybee’s sense of reward, leaving it much more attached to the caffeinated food source. The honeybee’s sense of reward is highly tuned to the percentage of sucrose present in the nectar, i.e. to nectar quality. The ability of the caffeine to mess with this sense indicates that plants might be able to trick honeybees to forage for longer in flowers containing low quality nectar. 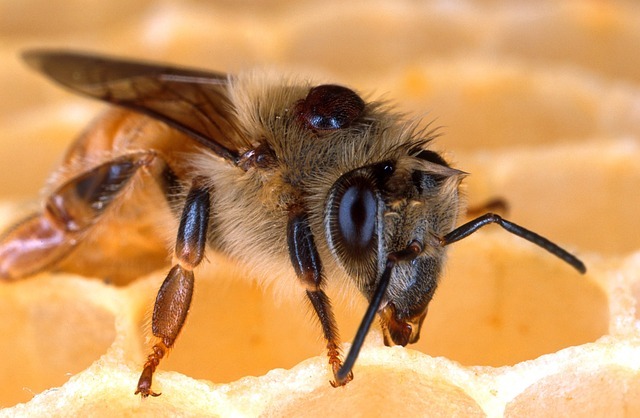 Using a theoretical modelling approach, the authors demonstrated that as a colony, the presence of caffeine quadruples recruitment for foraging, and can result in much decreased efficiency of honey production. It appears that the plants, not satisfied with a mutualistic interaction, rapidly cross the territory to exploitation whenever possible, and the little worker bees bear the burden. It was around 30 years ago when researchers demonstrated for the first time that insects enter sleep-like states and exhibit day-night cycles like mammals and other higher animals. Sleep has been demonstrated in fruit flies, cockroaches, honeybees, as well as some other insects. In humans, sleep has been shown to aid memory reconsolidation, especially if contextual cues are presented during slow-wave sleep. Whether this function of sleep is generalizable or not was not known until recently. A group of scientists in Germany decided to test exactly this. 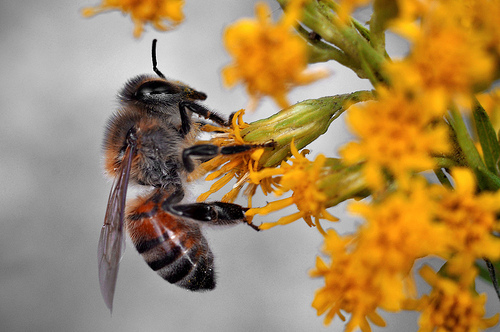 Honeybees can be trained easily on association based learning tasks. This means that if a bee is presented with a stimulus, for e.g. exposure to a hot object, and is given a reward, for e.g. a sucrose solution, shortly thereafter, and it sees this phenomenon repeated multiple times, then it learns to associate the reward with the stimulus. The short-term memory of this learned event can be tested by waiting for 24 hours and presenting the bee with only the stimulus (the hot object). If it shows behaviors associated with the reward cue, like uncurling its proboscis in anticipation of drinking, it shows that the association is remembered from earlier. Bees are also sensitive to context – for e.g. if a sharp smell was present throughout the period of training, it associates the smell with the learning task. The experiment that Hanna Zwaka and colleagues tried was the following. They trained bees to associate a thermal cue (presence of a hot object) with a food reward (sugar solution) in the presence of a distinct odor. Then they waited until bees were in deep sleep (checked by measuring antenna movements), and then presented the bees with the odor that had been present during training and trials. The next morning, the bees were tested for their memory of the association task, and the bees that had smelled the context odor during the night came out on top every time. This was an interesting observation, but one cannot tell from this experiment if simple re-exposure to odor is sufficient to reinforce the memory, or the bee needs to smell it during a specific stage of sleep in order to have an effect. So, to check whether it was just the presentation of odor or the stage of sleep the odor was presented in that was important, the researchers provided the odor to the bees at different times during the day or night when the bee was not in deep sleep. 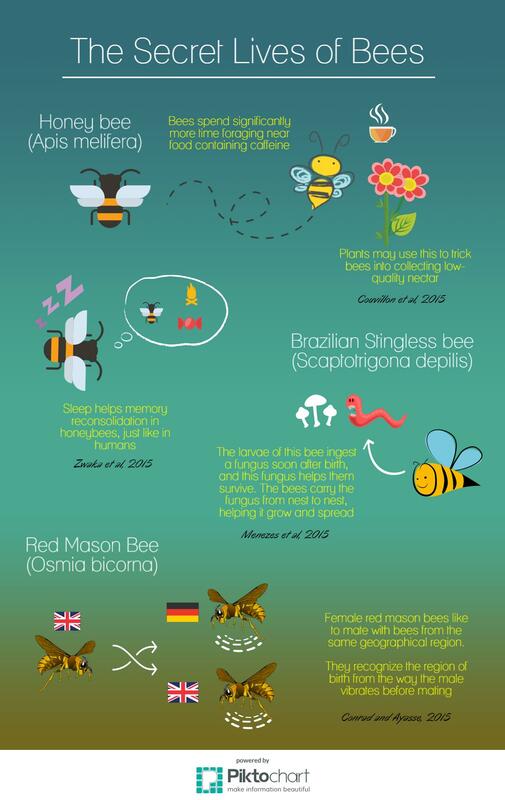 In all of these cases, there was no significant improvement in memory retention for the bee. Similarly, presenting a completely new odor had no effect on performance whatsoever. The result of the experiments go on to show that sleep serves as an important function in memory consolidation, an effect that seems to be conserved from invertebrates like honeybees to mammals like humans. Humans like to think that they invented farming, but the truth is that were beaten at it by several million years by several organisms that show surprising resource and ability to tend specific crops for mutual benefit. In the insect world, ants, some termites, lizard beetles, leaf rolling weevils are only a few of the species that show remarkable farming-like behaviors. And now, scientists in Brazil have discovered the first indication that bees too grow a special crop, especially for their young, and depend on this crop for their survival. Brazilian stingless bees live in large hives, with many small cells for the eggs to hatch and larva to grow. ‘Nurse’ bees provide food for the young – a semi-liquid mass of food which they regurgitate into the cells. Once this is done, the Queen bee comes and lays a single egg on top of the food in each cell. After this, the cells are sealed from all sides, and are broken only when the eggs have grown into adults and emerge. Cristiano Menezes and colleagues observed a curious white coating on the walls of these larval brood cells. On closer investigation, the white layer appeared to be a fungus, which began to grow rapidly once the egg was about to hatch. Pretty soon the fungal mycelia had crept up over the larval food, and within a few days after that, the larva had eaten up all the fungus along with its food. To check if the presence of the fungus in the larva’s diet affected its health or survival, the scientists brought the larvae out of the brood cells and grew them in the laboratory, in acrylic cells filled with the larval food collected from actual, live nests. However, this food had undergone a mild processing – specifically, the food was sterilized using UV light before being presented to the larva. For half the larva, the scientists added the fungus from the hive walls to this sterile medium, while for the other half, only the sterile food was used. Only 8% of the larva survived on the sterile food, while over 75 % survived when the fungus was present. This led the researchers to conclude that the relationship with the fungus was a beneficial, obligate one for the bees. While it is presently unclear exactly what role the fungus plays in ensuring the survival of the bees, one likely possibility is that it synthesizes antimicrobial compounds that protect the larva from infection. What does the fungus get out of this deal? Like all crop species, the fungus is helped by the farmers in its propagation. The fungus was found in ample amounts in cerumen, a mix of wax and plant resins used in building the bee nests. When bees move to new hives, they recycle cerumen from the old nests for use in the new one, hence spreading the fungus forward. And thus the relationship between the farmer and the crop continues. Red Mason Bees (Osmia bicornis) are found throughout Europe, and differ from honeybees in several respects. For starters, they do not form the complex hives and social systems of their honeybee cousins, nor do they prepare any form of honey. Each female builds its own nest, and chooses the males it mates with by using a list of specific criteria. 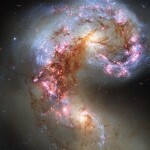 One of the items on this list is the nature of thoracic vibrations that the males can produce. The longer the male can vibrate, the stronger it appears, and better the offspring would be, in the reasoning of the female. But the vibrations differ from male to male and place to place, not just in duration, but also in frequency and amplitude. Taina Conrad and Manfred Ayasse, researchers from Germany, decided to test whether the vibrations carry any information other than the fitness of the male. 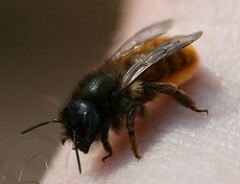 Red Mason Bees are found throughout Europe. Conrad and Ayasse obtained bees from different geographical regions (England, Germany and Denmark) and tried to see how well the males and females mate when paired off with a partner from the same region versus a partner from a different region. It appeared that females strongly preferred to mate with males from their own region, with the worst combination turning out to be a German male paired with an English female (go figure). Since all the bees used in the assay were strangers to each other, there needs to be some indicator that lets the females know that the males in question are from a different location. The researchers strongly suspected that the vibrations may play some role in it, and proceeded to test it using an interesting set of experiments. By attaching a small magnet to the chest of the male, and placing the mating pair on top of an inductor coil, the researchers could measure the vibrations of one male, and superimpose it on another, thus artificially generating a pattern of vibrations that the female could sense. And now when you present an English female with a German male, and give this male the old English vibrational pattern, the female suddenly becomes a lot more receptive to its charms, and mating frequency skyrockets. And vice versa. Even more curiously, if you pair off a German female with a German male, but force English vibrations onto the German male, the females no longer appear interested in the males. These results show that Red mason bees can use vibrations to glean locational information, and the European bees are possibly in the middle of a speciation event, where geographically separated subpopulations of a species progressively become more and more reproductively isolated from each other. Bees have fascinated humans for centuries and will continue to do so for a long time, and not just because of the deliciousness of the honey they produce. These studies all demonstrate that the lives of these little critters hold many surprises yet for humans who study them, and sometimes a closer look is necessary to get a sense of the complexity that lies beneath the surface. Couvillon MJ, Al Toufailia H, Butterfield TM, Schrell F, Ratnieks FLW, Schürch R. Caffeinated Forage Tricks Honeybees into Increasing Foraging and Recruitment Behaviors. Curr Biol 2015;25:2815–2818. Zwaka H, Bartels R, Gora J, Franck V, Culo A, Götsch M, Menzel R. Context Odor Presentation during Sleep Enhances Memory in Honeybees. Curr Biol 2015;25:2869–2874. Menezes C, Vollet-Neto A, Marsaioli AJ, Zampieri D, Fontoura IC, Luchessi AD, Imperatriz-Fonseca VL. A Brazilian Social Bee Must Cultivate Fungus to Survive. Curr Biol 2015;25:2851–2855. Conrad T, Ayasse M. The Role of Vibrations in Population Divergence in the Red Mason Bee, Osmia bicornis. Curr Biol 2015;25:2819–2822.